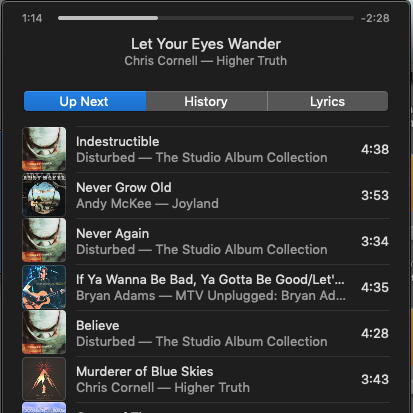 The themes of The Wishbone Conspiracy are getting clearer for me, and I did a pretty major rip-apart of the playlist I’m using to stay focused on the novel during my two days a week, and to get myself into that place every time I write. I might have too many songs in the list. For some books, I’ve looped just one song (which drives people around me nuts). But this is a big story I’m telling, with secrets inside of secrets that are sneaking onto the page. So for now, it has a pretty long list that won’t give me a lot of repetition. Here’s the new list. A lot more Disturbed, some instrumentals, some Chris Cornell, some old stuff that connects to this in ways I haven’t figured out yet. Am I the only one who is intrigued by the idea of a Muse selecting the songs? It might be fun to have a video of Holly as she updates her list next. Maybe for the patreon supporters? Disturbed 😄 I listen to their new album “Evolution” practically every day.